For web developers everywhere, Internet Explorer 6 has been a trouble maker for quite some time. The code may seem perfect and the website can look beautiful on Safari, Google Chrome, Firefox, Opera and even Internet Explorer 9, but look terrible on the 6th version of Internet Explorer without significant effort to fix. This week, Microsoft announced they will no longer be supporting or updating Internet Explorer 6. Less than 1% of United States Internet users use IE6. Microsoft's cake celebrating the demise of IE6. PC World explains several reasons why you should abandon IE6 in their article "If You're Part of the IE6 One Percent, You're Doing It Wrong". The article points out that IE6 is over a decade old and was developed prior to all of the malware attacks that are all over the Internet today. This is a large security concern for those users. 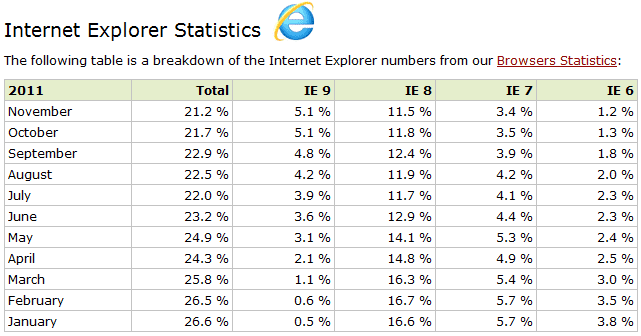 I'm surprised that the 1% of IE6 users have not picked up a virus on their computer yet. Microsoft also announced they will begin automatically updating Internet Explorer for users, similar to Firefox and Google Chrome which will be a nice feature to keep people updated moving forward. 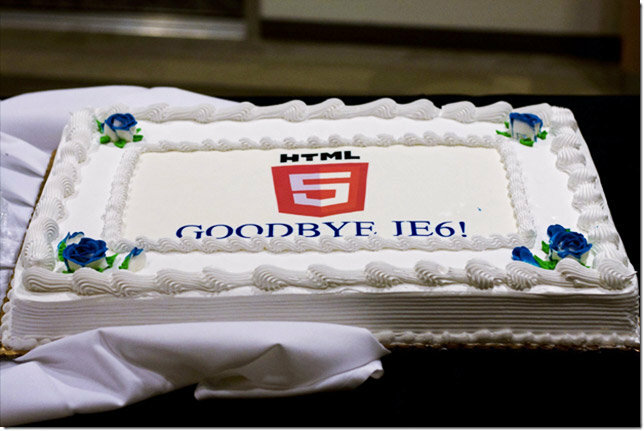 Microsoft was even celebrating the demise of their 6th version of Internet Explorer. EWeek.com posted an article called "Microsoft Trumpets Internet Explorer 6's Impending Demise". They also made a cake for the celebration. Roger Capriotti, a member of Internet Explorer’s marketing team, stated Austria, Poland, Sweden, Denmark, Finland and Norway's IE6 users have also dropped below 1%. According to StatCounter, in the United States 47% of users use Internet Explorer, 20% use Firefox, 18% use Google Chrome, 12% use Safari, 1% use Opera, and 2% use other browsers. Below is a graph breaking down the usage of Internet Explorer browser usage. As programming languages get more advanced, browsers will need to follow suit. Without IE6, most of the popular browsers are compatible with the newest features in web design. Like most technology, browsers will have to make updates often to keep up. Humorously, Mashable wrote an article in January 2010 about IE 6 titled 5 More Reasons IE 6 must Die... obviously, its been a long time coming. Are you a part of that 1% still using Internet Explorer 6? It's okay. You just need to upgrade as soon as possible. For your computer's safety, you should upgrade to IE8 or IE9. There are also several other browsers to choose from out there: Firefox, Google Chrome, Safari, and Opera (just to name a few). TBH Creative is a web development company located in Indianapolis, Indiana. We keep up with web technology and design to best help you maximize your online marketing potential. Engage in a web consultation with TBH Creative and we'll help you figure out where to go next and explore your options.